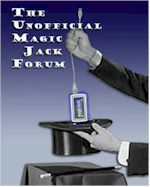 Having issues with your magicJack? Post here, and we'll try to help you out! Features that are coming "soon". Area Codes, Caller ID blocking, Follow me, etc. If you have magicJacks, magicJack accessories or magicJack related software sell it here. Post your reviews of magicJack. Include items such as call quality, feature usage, fax sucess, EULA thoughts, price considerations, support issues, etc.